One of the ways we make your customer experience more convenient and efficient is by offering our Consultation Services. 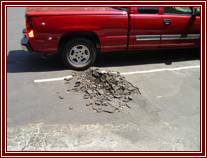 Because we have been in the asphalt industry for 30 years, "We've seen it all." 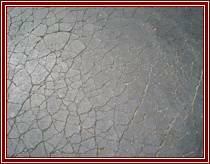 We know which asphalt repair methods are long lasting and which are the more temporary solutions. We've solved parking problems by creating new striping layouts to increase parking, direct traffic flow, and meet the ever changing handicap parking requirements. Because of our years of experience we can help you decide what is needed to achieve the desired result for your asphalt. 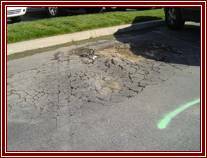 You find yourself pulling out your hair, because you are attempting to hire a company to repair your asphalt, but it's so confusing because each company seems to have a different opinion about the method of repair. It makes comparing the bids impossible and you just can't decide what to do. It's frustrating and cliche, but it really is like comparing "apples to oranges." To help simplify the bidding process, we will provide a suggested method of repair along with a detailed plan to use when procuring other bids. Our fee for this is nominal, and will be credited towards payment of the work if we are chosen to do the job. So, you find the old striping layout of your parking lot doesn't seem to work anymore and you need a new striping layout for your current parking situation. You could consult with an architect and have him draw a set of plans, but it's going to cost you more than a few bucks. For a small design fee, we will work with you to design a simple striping layout that will solve your parking problems. Our price includes a fully dimensioned plan and again the design fee will be credited toward the cost of the job, should be we chosen to help you do the work. You find out that your handicap parking does not meet the current Federal or State requirements and the city is breathing down your neck, or worse you have left yourself open for an Americans with Disbility Act lawsuit. Your handicap parking area is too steep, your asphalt ramp is out dated, you don't have the required Van Accessible stall, or you're missing the required signage. We are up to date on all Federal and State Handicap Parking requirements. Again, for a small design fee, we will work with you to design the necessary asphalt or ramp repairs, new striping layout, or signage to bring your handicap parking into compliance. As with the other design fees, the cost will be credited toward the invoice, should we be awarded the job.